York City were crowned British Waterpolo Championship 3 winners after an emphatic comeback against big rivals Cheltenham Spartans. The Minstermen went behind early on after a lapse in communication saw J.Ross fire home for Cheltenham from seven metres. But goals from Toby Clarkson, Nick Boaz and Danny Rippon saw the Division 4 champions claw their way back to 3-3 at the end of the first quarter. Cheltenham once again took the lead, just before Joe Rippon's superb backhand levelled up the scoring. Once again, however, the Minstermen allowed themselves to round the half up trailing, as the Spartan's Sam McKie buried his short range effort past a despairing Andrew Morris. Just after the break, last year's Championship 4 victors doubled their lead over York when James Banfield pulled off a chic lob, once again over the despairing Morris. Morris quickly made up for it, however, when York's Kevin Clarkson stray pass was picked up by a Cheltenham winger the York 'keeper announced a contender for save of the season, seeing the ball out of a corner. The save apparently inspired a revolution as goals from Danny Rippon and Ben Pacey brough York level at 6-6, before the Spartans took the lead again with three seconds on the clock, at the end of the third quarter.The 'hairdryer treatment' from injured player Chris Burns appeared to leave York with warm scalps; in the first minute of the fourth quarter Cheltenham had extended their lead to 9-6, at which point Head Coach Dave Clegg said "I honestly can't see any way back from this. We've been coming back all season, but this isn't possible." However, Lucas seemingly wished to prove Clegg wrong, as he found the net having made an incredible swim penetrating the Spartans' defence. Then, two minutes later, Lucas scored another high speed goal as captain Paul Floyd's pinpoint pass left him no choice but to pull York within one goal of Cheltenham. Danny Rippon then scored an infamous 'triple bouncer' from inside the pit to leave the Spartans in turmoil at 9-9. York's immediate time-out proved brilliant. With Burns' wise words echoing in the minds of the squad for the final 90 seconds, captain Floyd cut the Spartans apart before slotting the ball past a helpless John Simcox in the Cheltenham goal. The victory ensured the Minstermen won their first Championship title since 1976, which was witnessed by Head Coach Clegg, who said "We're seeing the glory days again at the club. It's fantastic to see such character out in such manic situations." The rest of the season was very similar to the Cheltenham match. A three-match-weekend saw the Minstermen kick off the campaign against Watford, Otter and Southampton, winning 17-13, 15-14 and 9-8 respectively. The match against Otter was won with eight seconds remaining, courtesy of Chris Burns. Two weeks later, the Minstermen travelled down to Matlock to play Bridgefield and South Derbyshire, winning 11-9 and 11-10 respectively. The South Derbyshire match also saw late drama with Pacey netting a lob with just 12 seconds on the clock. Then came the final weekend of the British Waterpolo season, and having beaten Cheltenham Spartans 10-9, York became champions. 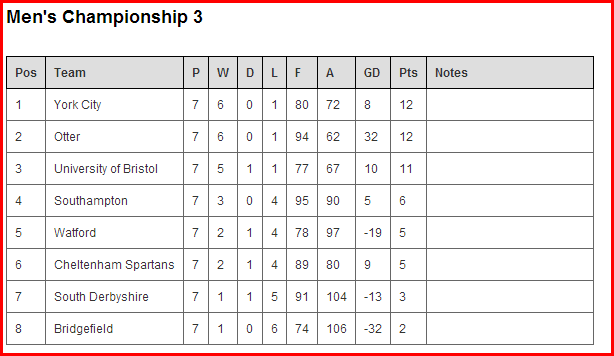 They had one more match to play in the season as champions, facing a co-promoted University of Bristol. The match saw 17-year-old Matthew Graves make his national league debut, and he pulled off a save which put Morris' 'save of the season' award in jeopardy. Paul Floyd summarised with "If you'd have told us we'd win 13 from 14 this season to win the league I wouldn't have believed you. "We've really proven just how much we can achieve. Next year will be a different story, however: we can't afford to stop concentrating in Division 3." Anyone interesting in starting waterpolo should contact Kevin on contact@yorkwaterpolo.org. Confident from the fine performance vs Southampton the York Water polo team continued their fine form with a controlled demolition of Dover. Intent on making a mark on the elite league York started the game with high intensity, Dover aggrieved at a loss the previous day were up against it from the first whistle with York racing to a 4-0 lead in the first quarter with goals from Clarkson E, Boaz and Rippon D (2). The 2nd quarter become a game of attrition with the Dover team determined to make a fight of it, great defence from both team made goals hard to come by but the York side disciplined attacks allowed for them to win the quarter 3 -1 with goal from Clarkson E, Burns (2). York's strength in depth paid dividends in the 2nd half and some clinical finishing punished the tiring Dover team leaving the score 16 -2 in favour of York City, with goals from Rippon J, Burns (2), Toomey, Boaz (2), Birkby(2), Rippon D.
Overall a great start to the weekend leaving the York team at the top of the league after round 1. Following an absence of 29 years York City delivered a triumphant return to the Elite League recording a 13 - 8 victory over a strong Southampton side. York travelled to Walsall with a strong squad with a good mixture of youth and experience. The first quarter was a tense affair with both teams having a strong defence, as York continued to pressurise the Southampton defence cracks began to appear, York seized the advantage with goals from Boaz (2) on his way to a man of the match performance, Floyd and Rippon D leaving York in control of the game at the end of the first quarter. With York's confidence increasing they began to apply the pressure and played some excellent polo that Southampton could find no answers for, especially with York's shot stopper Morris in fine form when called upon. York ran out 13 - 8 winners with further goal from Boaz (5), Burns, Toomey (2), Rippon J. After a turbulent couple of weeks in the aftermath of some high profiled regional political dramas, York A team looked to put all that behind them, and concentrate on their recent run of good form in another potentially enthralling match up against Sheffield B. With another packed ‘fathers-day’ crowed at the International Arena, Ponds Forge, York A took on the same team who they trounced only a few weeks ago. This match-up however, looked to prove somewhat of an entirely different challenge. York had travelled with a slight change of personnel, boosted by some hard hitting prolific individuals from the York B team, and who in fact had turned up to face a rejuvenated Sheffield team, strengthened by some of their ‘heaviest’ National League players. The game got under way and within the blink of an eye York had found themselves 2-0 down - some lacklustre defending and slow reading of the game being to blame. Captain Floyd set the precedent with an initial fight back with a well-taken goal, before York levelled at 2-2. From then, York couldn’t wait for the first quarter to end; 4 unanswered goals ensured that York had plenty of chasing to do as they entered the second quarter, 2-6 down. The second quarter started, just as it has ended, with all momentum in favour of the home side. Sheffield, really making advantage of their double deep pool, had some joy from a couple of harsh refereeing decisions on York, and were awarded 3 power play attacks, of which they punished York with each. With York trying to stick in the game at the end of the first half, they countered with a man up of their own, and with a tactical timeout called from Captain Floyd, it gave York a chance to re-group, and perform their training ground man-up play. Moving the defence perfectly out of position, it gave ‘Golden-Arm Pacey’ the chance to place the ball exquisitely past Sheffield’s flailing keeper. Buoyed by a couple of late goals, York men came into half time with a glimmer of hope, but their performance still wasn’t good enough to avoid ‘mastermind Clegg’s’ brutal ‘hairdryer’ half time team talk. With some stern defensive advice, York started the second half just how they should have started the game and instantly, York fought their way onto 2m and claimed the first penalty of the game. With ‘Not-So-Golden-Arm Pacey’, having missed his last penalty for the Minstermen, and with Boaz missing on International Duty, it was left to Senior Burns to slot it away in the top stanch beyond the keeper. With a couple more quick fire goals, York started to put on the afterburners. Enter York B rising star Ed Carey. With words of ‘get up there and cause some trouble’ ringing in his ears from Captain Floyd’s pre-match prep talk, Ed did just that, and justified exactly why he deserved his A team call up. With some strong battling, up in centre forward, Ed claimed another brilliantly fought penalty for the Minstermen, which was again coolly slotted by Burns Senior. With another wonderfully taken goal from the centre forward position, leaving him with 4 for the quarter, it was nonsense to even think that Burns Senior only just scraped through the pre-match fitness test to play. In reality, York really did need some inspiration and with just that, they came into the 3rd break, having won that quarter 3-5, not with quite as big a mountain to climb. As dramatic as this comeback would have been, the dream of a sensational York victory quickly faded, with Sheffield reasserting their dominance quickly from the start of the 4th quarter. It was York’s poor defending, rather than Sheffield’s insurmountable attacks, which cost York the overall defeat. 6 goals in the last quarter from Sheffield left Morris with some severe questions of his defence, and ones that could only be answered with some hard graft back in the training pool. 2 late York goals, one from Captain Floyd, and another exquisite lob from Jnr Toomey, meant the game finished 20-11. In truth, York faced a strong, well-disciplined, Sheffield attack, and an attack, which at times were clinical in their finishing. With little room for error, York missed the opportunity to tighten the game up with some solid defensive play. At the other end, York proved why they are quickly turning into a prolific attacking team, with some superbly worked goals. Moreover, this game was a good chance for York’s B team contingent to get a taste of the quick pace of Division 1, and probably the best thing to take from the game, is that experience that Carey, Jnr Burns, and Renshaw will have taken home with them. This game, a blemish on the York season, I’m sure will not dampen the mood going into their next fixture (against Barnsley at home), but rather, provide inspiration to train harder and better in the quest for regional dominance. After a disappointing last minute draw against Huddersfield, York A Men’s squad were ready to redeem their selves against British Water Polo League (#BWPL) division 5 team, Sheffield Steel Dolphins. The Minster Men were yet again welcomed to a jam packed stadium at the Archbishop Holgate; supporters of both teams really struggled to find a space in the parking lot! The match promised to be a real close affair. York, unbeaten so far this season in the squad swim-off showdown were really pushed, Clarkson senior clawed lost ground back in the final 25m, forcing Umpire Dougie to call a tie! Both teams shared those valuable SSS points. The first quarter was an epic battle between centre forwards and centre backs, Umpire Dougie calling sin bin fouls against both Lucas and Simpson. Luckily York’s defence was as strong as those walls that surround the great historic city. An immediate counter attack which the dolphins couldn’t handle, led to their exclusion foul. A well worked power play, which was calmly put into the lower left of the goal interior by Pacey with a real neat skip shot, opened the scoring. Further goals by Boaz and Floyd put the quarter out of reach for the dolphins. The second quarter was more of the same: York wall defence, supplemented by some super, controlled play by York around the arc of attack, making mincemeat of Sheffield’s game play. Dean “Shallow End Specialist” Toomey gave an excellent period, scoring three real awesome goals! PENALTY! Umpire Dougie made a controversial, five meter penalty death strike foul against Burns senior. The booing crowd were real mad; WAG Levitt threw her water on the floor in disgust, dramatic scenes! However, goal tender Morris, wearing his red hats, wasn’t fazed by the occasion. Muzza rose like a Canadian Salmon and kept the polo ball out of his goal interior. Coach Clegg was ecstatic remarking “GOOD BOY!” An instant counter attack saw York lead 7-0 at the half. Going into the third, York maintained their juggernaut like momentum, Lucas and Burns, making amends for their sin bin offences, scored two excellent goals. Boaz finishing off the scoring in that quarter with steam roller which nearly ripped the goal interior net in half! Goal tender Deutche had no chance. York’s superior defensive work throughout the quarter, in particular Clarkson Senior, helped The Minster Men maintain a clean sheet heading into the fourth quarter. Dolphin’s coach Simpson was real mad his team hadn’t yet scored a single goalshot in the whole tie! After a final inspirational team talk from coaches Clegg and Floyd, The Minster Men were focused on securing the victory and maintaining that ever so important clean sheet for the red goal tender Morris. The final quarter started off real great, with a goal shot straight in the upper ninety of the goal interior from A Team debutant Birkby. The crowd were pleasantly surprised, due Birkilby’s first few goal strikes nearly took the pool lifeguard out of his chair! Later in the quarter Umpire Dougie decided to sin bin Sheffield’s Watson for dirty play. This gave York the chance to work on their power play once more. Everything went to plan except one thing: Clarkson Senior had to make the goal shot! Sheffield, calling a drop, were sure he wouldn’t make the grade… Clarkson collected the ball, via a real neat backhand pass from Paul “Show Boat” Floyd. Clarkson stuck his chest out and slotted the polo ball into the water polo goal interior. What a power play! The crowd went crazy, even the experienced Umpire Dougie looked impressed and man has he seen a lot of water polo! From highs to lows, after the celebrations, one lapse moment in defence saw Sheffield’s Watson put home a real pesky skip shot from outside the yellow, five meter zone, redeeming himself from his earlier sin bin offence. Goal tender Morris was furious, so close to Holy Grail of a clean sheet tie, maybe next time buddy! The match ended with a brace of lob goals from “Show boat” and a super counter attack goal strike from Burns senior. Some awesome, controlled displays of speed, strength and agility saw York going forward and covering back in numbers, making The Steel Dolphins look real rusty in the water. In this year’s BWPL division 5 York will be making their debut appearance in the British nationalised water polo league, meaning Sheffield Dolphins will be their main local arch nemesis rivals. If tonight’s game is anything to go by, you may as well hand the BWPL trophy over now! Keep up the hard work! LET’S GO MINSTER MEN! After a close high scoring game against Leeds, the B team were eager to establish more of a lead in their next game against Grimsby. A great start saw Jono Birkby and Jonathan Lucas score 2 goals each establishing York's dominance, with Grimsby unable to find the back of the net until the last minute of the first quarter. A less eventful second quarter saw two goals apiece with Sam Haywood getting onto the score sheet. By half time, the score stood at 6 - 3. The third quarter saw York stepping on the gas, scoring a staggering 7 unanswered goals from Dean, Lee, Patrick, Kieran and Jono. A missed penalty showed that Grimsby were crumbling under pressure with frustration written across their faces. Three more ticks on the sheet came from Troy and Jono, which saw the B team keep ahead, however, perhaps overconfident of their impending victory, York's defence relaxed. The mistake was jumped upon by the Grimsby team, putting away 6 goals, with even their goalkeeper getting a mark on the score sheet (to the clear dismay of York's own keeper Harrison Clayton). In the end it was not enough to repair the damage already done. Running high on confidence from their previous match vs. Barnsley, York entertained Huddersfield in a packed Archbishop Holgate's stadium. It was a frantic last 7 minutes in the 4th and final quarter. York were confident of their superior fitness and began rapidly, but were forcing the game and making sloppy mistakes; the opposition took full advantage and scored on the counter attack. With Huddersfield now worrying the home side, it was vital that York slowed the game down. Some excellent CF play from Boaz got the Reds their only goal of the 4th after turning his marker and calmly slotting in the bottom corner. It was turning into a feisty and nervous contest and in the last minute York GK Morris pulled off an outstanding 1v0 save to keep the game locked at 7-7. The Minster Men immediately countered and were awarded a penalty in the dying seconds of the match. The so called "hotshot" Ben Pacey was handed the chance to give York a vital win, but he choked big time! The pressure obviously got to the no.7 and post-match supporters were heard saying "he may as well have passed the ball to the Huddersfield GK"! Unbelievable Jeff! A great contest that will live long in the memory, both teams disappointed not to take all the points but happy not to lose them either! An exhilarating nail-biter of a contest was fought out between two evenly matched teams at the Armley sports centre in Leeds. York handed a debut to new recruit Jon Birkby, who was thrust straight into the action for the first quarter. Leeds were quickly out of the blocks and raced away to a 3 – 0 lead; things were looking ominous for the York Side, but new boy Birkby was having none of it and two quick-fire goals brought York back into the match. The 2nd quarter did not go well for York either, with the Leeds team defending with determination, which enabled them to break down many a York attack. The Leeds team were sharper and managed to score several break away goals, leaving the York keeper, Harrison Clayton, asking questions of his team mates’ defensive awareness. At half time York trailed 8 – 5. A rousing half time team talk from captain Jonny Lucas and the inclusion of old timer Dave ‘boy’ Clegg saw York come out in the 3rd quarter like a different team. Captain Jonny led from the front and scored 3 quick-fire goals. Some resolute defending from Clegg and Lee ‘Senior’ Toomey laid the foundations for a great goal from Ed Clancy that had the Leeds team spinning. Some ill-discipline from Dean ‘ Junior ‘ Toomey allowed the Leeds team 2 man up opportunities, which they took full advantage of leading to York finishing the 3rd quarter leading 14 – 11. City of York Water Polo Club has two senior teams in the Wakefield and District League and also, for the first time in over 20 years, an Under 16 side. The youth section trains at St. Peter’s School every Sunday from 6:30pm; it is open to children from the age of 8. After a slow start to their 2013 Wakefield and District Water Polo League campaign, York City Water Polo Club produced an efficient, disciplined and ruthless performance against a physical Barnsley side. The match, which took place at Archbishop Holgate's School, was their fourth game of the campaign and the team showed some promising signs in preparation for entry into the National League. Bridging the generation gap, the father and son combination of Kevin and Toby Clarkson demonstrated the broad appeal of the sport and a 4th quarter break-away goal, involving the veteran combination of the elder Clarkson and Club Coach Dean Toomey, was very encouraging. Former GB Water Polo player, David Clegg, commented: “The lads showed some really encouraging signs this evening; there was only one or two loose passes and very few wasted opportunities!” Praise indeed from a man with such high standards. York surged to a 4 -1 lead in the 1st quarter, aided by some accomplished goalkeeping by Andy Morris. The 2nd quarter was much closer and York defended well as a team to reach half-time with a 6-2 lead. In the second half, the superior fitness of the York side began to stretch a tiring Barnsley side. A weak Penalty shot from captain Paul Floyd was the only blemish in a strong 3rd quarter performance that saw York extend their advantage to 12-4. In the final quarter, York allowed the veteran players a free-reign and they were able to control the game with great ball retention and several lightning fast breakaway goals. A slow start from an inexperienced York side saw Castleford take a quick 4-0 lead. York then settled down and some good work saw the score back to a respectable 6-4 to Castleford at the end of the first quarter. The visitors continued to score off the break, clearly something that we need to work on along with our awareness of each other in the pool, however, overall it was a really good performance. We scored in every quarter, although Castleford’s fitness and experience saw them take control as the match went on. They eventually went on to win 22-9, but it was a spirited performance from the York side and everyone can be proud of their input. York A were out of the blocks quickly gaining an early advantage at the John Smith's Arena on Tuesday evening. Huddersfield failed to cope with the early quality shown by an impressive York outfit. York took an early five goal lead with Pacey, Boaz and Burns all registering goals. Unfortunately, a change of tactics and players made by the Huddersfield coach encouraged a fight back from the home side. At half-time the gap had been closed to two goals. York A entertain Barnsley on Thursday 24th April. A game that York will expect to take full points from. York City Water Polo Club has been accepted into the British Water Polo League for the first time since 1984, when York played under the County of York team for a number of years. This is an exciting progression and a true reflection of the aspirations York has to rebuild the successes of yesteryear. The National league is set to kick off in Mid-September, so look out for more exciting news, later on in the year. The York A Team got off to a good start to the season with a comfortable win over Normanton in the Division One K.O. Cup. Early goals from Pacey and Lucas set the tone for a controlled performance. A strong defensive display led by a solid game between the sticks from shot stopper, Morris ensured York remained in the lead for the remainder of the game. Superior fitness from the York team led to late goals from the experienced pair of Toomey and Floyd, which enabled the away team to see out the game with a 5 goal cushion. Final Result: NORMANTON 3 - 8 YORK. The A Team turn out again on the 9th April to play Huddersfield away, a game that will be a much tougher encounter. York's B team were put through their paces against Halifax at home for their first ever game. A nail-biting game to say the least, York's superior fitness gave them the edge allowing them to clinch a well earned victory.